As a conductor Lorin Maazel is more variable - and controversial - than most. He’s one of those baton-wavers who can turn in a perfectly routine performance one day and lead an astounding one the next. The stories of his manner - intractable, arrogant - are legion, and generally he doesn’t get a good press on the UK side of the Atlantic. I’m not one of the nay-sayers, though. I’ve heard him give more good performances than bad ones. Even so, his CBS/Sony Mahler was so uneven I did wonder what he could bring to a table already groaning under the weight of fine sets. Those were my initial thoughts before I sat down to review his Concertgebouw Mahler Sixth. In the event I was utterly persuaded by the performance, which has all the heat, thrust and sheer concentration I look for in this symphony (review). Indeed, it’s one of the better recordings of this work to have come my way in recent years. It certainly isn’t the painfully slow, wayward reading that leaves Maazel’s critics foaming at the mouth. Still, that’s just one concert, and where Mahler symphonies are concerned it would be an exceptional conductor who excelled at them all. These 2011 Philharmonia concerts had mixed reviews from our Seen and Heard team, but I deliberately avoided refreshing my memory before listening to this box. Minutes into this grossly exaggerated account of the First Symphony and any feelings of good will towards this maestro began to evaporate. Dynamics are very extreme - one has to crank up the volume to catch the forest murmurs at the outset, only to cower at the big, brazen climaxes that follow. Where is that essential air of wonder, that eye-blinking delight as our hero steps from gloom to glade? That’s just the first of a multitude of sins. Not only is Maazel impossibly po-faced he’s also outrageously self indulgent. Mahler’s clear, crisp rhythms are smudged and blurred, phrases stretch and twang. The sprightly Ländler in the second movement offer some respite, but alas it’s only temporary. Before long we’re back to that same humourless, halting manner. The close, rather airless sound doesn’t help matters, and I began to think this cycle was a horrible mistake. As if the stuttering progress of the second movement wasn’t enough the weird funeral cortege in the third is devoid of its usual strange charm. Maazel changes tack at will and insists on pointless emphases and underlinings. The music doesn’t respond well to this treatment, and if the intention is to heighten the mood it has precisely the opposite effect. The players trudge on, bless ’em, but despite their best efforts the cumulative power of that vigorous finale is lost in a welter of gruff tuttis, unscheduled excursions and a signal lack of animation and focus. Goodness, it’s hard to imagine a more arbitrary, misconceived and soul-destroying Mahler First than this. It certainly doesn’t augur well for the rest of the series, although I did try to lift my sagging spirits with fond memories of Maazel’s rather fine CBS/Sony Resurrection, which I once owned on cassette. The start of this new account sounds rather boxy, and the opening figures aren’t as agitated as they could be. That said, there is something of the tugging undertow that’s missing from Maazel’s Philharmonia First; most important, he doesn’t pull the music about quite so much. Despite reservations about the recording at the outset it does improve; at last there’s colour, detail and a liberating sense of space. Also, the lovely tunes in Mahler’s well-stocked arboretum are allowed to bloom and grow naturally, and there’s a warmth and spontaneity to the performance that’s most appealing. How very different from that dull, lifeless First, and how polished and alert the playing. Climaxes are suitably arresting - if a little close - and there’s only an occasional spike of irritation when Maazel intervenes with a sudden push or pull. That said, when the performance is as gripping as this - there’s a fierce concentration here, an electricity - it’s much easier to forgive such minor aberrations. Signum split this symphony over two discs - at 92:41 this is one of the longer versions of the Resurrection on record - with just the opening movement on CD 1. Happily Maazel captures the lilting loveliness of the Andante, and once again I was seduced by the character and point of the Philharmonia’s playing. That’s especially true of the quieter moments. That the more declamatory ones are a tad forceful probably has more to do with balances than with any insensitivity on the orchestra’s part. Still, it’s a decent recording, and it’s only when one listens to David Zinman and Jonathan Nott in this work - admittedly both on SACD - that one misses small nuances and the last ounce of transparency. The third movement is beautifully articulated, its twists and gurgles so well caught. There’s a greater sense of engagement on Maazel’s part, and that communicates itself in the unmistakable smile and geniality of the music-making. No reptilian aloofness here, I’m pleased to say, and Mahler’s glorious tuttis are scaled to perfection. Pizzicato strings, rasping brass and shimmering percussion are all much better rendered here than in the First. Only in Urlicht does Maazel succumb to that old bloat; and anyone used to the steady, transporting stillness of Christa Ludwig or Janet Baker in this signature song will find Michelle DeYoung’s wide vibrato hard to tolerate. That’s a small blip - albeit crucial - but what follows more than makes up for any lingering disappointment. On its first appearance the Resurrection motif is as spine-tingling as it should be and there’s a strong feel of impending apotheosis that signals a thrilling finale. So it proves, for Maazel and his expectant players have already sighted the gates of Heaven and are intent on gaining entry. There’s no overweening urgency - if anything tempi broaden just a little too much - but then all concerned are reminded of their destination and splendour returns. For someone often accused of being cool and detached Maazel is more than capable of turning up the heat. The formidable timp-led crescendi here and the blistering finale of that Concertgebouw Sixth are ample proof of that. Indeed, he scarcely puts a foot wrong hereafter, and for the first time I wished I were in the hall for this one. True, the offstage brass aren’t as atmospherically distant as I’d have liked, but their effect is not diminished by that. By contrast the first choral entry is a little too soft and soft edged for my taste; still, the choirs sing with great passion throughout. Soprano Sally Matthews isn’t anything very special I’m afraid, but even though she and DeYoung don’t blend at all well I doubt many listeners will be underwhelmed by the momentous finale that follows. Bells. tam-tam and, to a lesser extent the organ, all make a splendid noise. Indeed, the blaze of light thus produced is simply blinding. I was just waiting for someone to yell ‘Bravo’ a nanosecond later, but there’s no applause on these discs at all. For once, though, I’d have been happy to join in the cheers. So, a woefully inadequate First and a bold, uplifting Second; now if only Maazel had fielded better soloists this would be one of the better Resurrections on record. It doesn’t displace Klemperer, Levine, Young or Nott in myaffections; and then there’s Mehta’s 1975 Vienna account, soon to be released on Blu-ray Audio as part of Universal’s ‘High Fidelity Pure Audio’ (HFPA) project. Now that should be something rather special; two fine soloists as well. 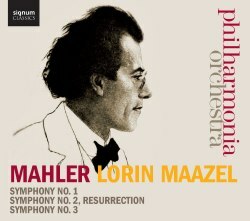 A very noticeable characteristic of Maazel’s new Mahler Third is its directness. There’s no added sentiment here, no special pleading. Even then, the emphatic bass-drum thwacks at the start of the first movement have a hard, uncompromising character that caught me by surprise. Indeed, Maazel brings enormous clarity and bite to what is often portrayed as a rather dewy-eyed work. The first movement especially has a snap and snarl that transfixed me from the start. These spare textures and telling details are well caught by the analytical but full-bodied recording. This symphony is shaping up to be the best in the box; not only is it so refreshing it’s also persuasively argued. Taut, springy rhythms sit comfortably with Mahler’s bucolic interludes, and the extreme contrast between them is just startling. The Philharmonia are in razor-sharp, virtuosic form, and they respond to Maazel’s every demand with alacrity. Abbado in particular finds a warmth and whimsy in the piece that appeals, and while Maazel is less generous in this respect he still brings out the distinctive sonorities and heart-lifting lyricism of this most engaging piece. Mahler’s debt to military bands has seldom been so forcefully honoured. Side and bass drums very much to the fore and the reveille-like trumpet-calls are piercingly effective. Another bonus is that Maazel doesn’t tinker and fret, so this incident-packed first movement unfolds, as it should, in a long, uninterrupted span. Goodness, Maazel really slams the door at the end. After that rude, earth-rousing Panic the meadowed musings of the Tempo di Menuetto come as something of a relief, although even here Maazel doesn’t relax too much. The sun-dappled music of this movement is played with a beguiling blend of affection and ease. As for the Scherzando it’s phrased and paced with a forensic precision that doesn’t undermine its essential rusticity. The off-stage horn, ideally distant, is achingly beautiful too. Surely even Maazel’s sternest critics can’t fail to be moved by the wondrous performance unfurling here? It’s a nodal point in this great musical drama and with it comes a powerful sense that the best is yet to come. That’s why I so wished I'd been in the hall for this one too. Once in a while a concert or recording comes along that acts as a valuable corrective, forcing us to hear a familiar work with new ears. I’d suggest this is one of them. Thanks to Tennstedt’s all-too-short tenure with the LPO that orchestra is closely tied to Mahler’s music, yet hearing the Philharmonia in such radiant form here reminds us of their late-flowering partnership with the great Klemperer. Back to the present and Sarah Connolly’s ‘O mensch’, beautifully spun, is kept aloft by diaphanous sounds from the orchestra. True, she doesn’t efface memories of Jessye Norman or Anna Larsson, but hers is a plangent, flesh-and-blood response to these profound, questing texts. As for the Tiffin Boys, their bright, incisive tones are just what’s required, and the link to the child-heaven finale of the Fourth seems stronger than ever. All too often this symphony’s long-breathed final movement unseams even the most promising performance, and I hoped that wouldn’t be the case here. Perhaps Maazel isn’t quite as seamless or as tranquil as Levine, Tennstedt or Abbado here, but he’s still wonderfully innig. Helped by rapt, intense playing he marshals his mighty forces with an unerring, uncanny instinct that marks out the finest Mahlerians. Really, this is an extraordinary, all-embracing summation of what is surely Mahler’s most generous and heartfelt creations. This is a performance full of surprises, so the pole-axeing peroration at the close comes as both a thrill and a shock. It certainly left me reeling. What a ride it’s been; a wilful First, a splendid Second and now an incandescent Third. Make no mistake, for all his faults - perceived or otherwise - this octogenarian conductor is a Mahlerian of considerable consequence. Moreover, I haven’t heard the Philharmonia play with such sustained intensity in ages, and that’s no accident. I wasn't sure I could endure yet another Mahler marathon, but if this one maintains its promising trajectory it will be well worth the effort. Huge contrasts, great rewards; a cycle to watch.